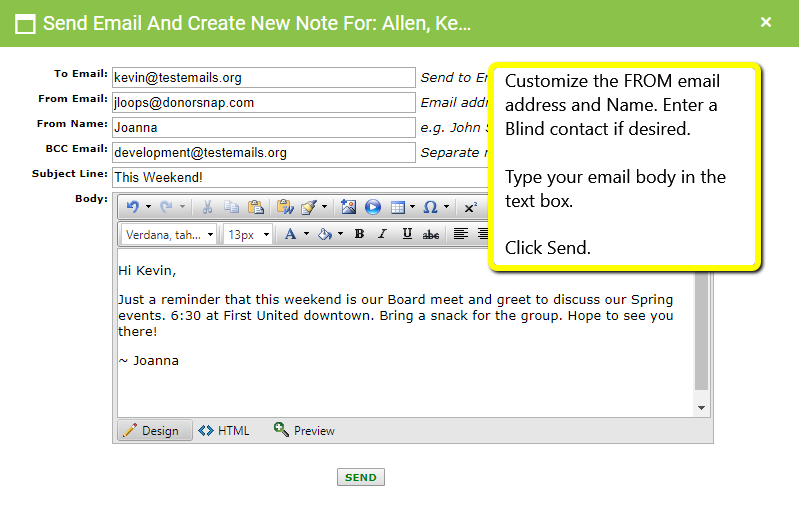 Use the Instant Email feature to send a quick email to a Contact in your database. This email will be sent over DonorSnap servers, however you enter your From email address so any Reply will return to your email address. These emails will also be saved as Notes upon sending. Choose your User name (top right of the program) and User Settings. Pull the Email field in to the Grid Fields Selected box. The email will now appear on the grid with an Email icon next to it. The email details page will appear. Once sent, the record of this email will be saved to the Notes tab. Once your email is sent, you can review the status of it from the Email Tracking page found under the Maintenance menu. On that page you can view the sent email, resend the email, and check to see whether it has been opened/clicked/bounced.